TV show dates: October 9, 2017 — January 29, 2018. Performers include: Christina Ochoa, Matt Barr, Charlie Barnett, Corbin Reid, W. Trè Davis, Nigel Thatch, and Melissa Roxburgh. A military drama, the Valor TV show comes from creator Kyle Jarrow. The series centers on the Shadow Raiders. After this crack unit of U.S. Army helicopter pilots embarks upon a top-secret mission to Somalia, only Captain Leland Gallo (Barr) and Warrant Officer Nora Madani (Ochoa) safely return. The fate of their comrade, Jimmy Kam (Davis), remains unknown. Back home in the States, Jimmy’s wife, Jess (Reid), knows she’s being kept in the dark about her husband, and it infuriates her. Jess isn’t the only one who suspects she’s not hearing the truth. Although he is her boyfriend, First Lieutenant Ian Porter (Barnett) has a feeling that Nora hasn’t even come clean with him. Meanwhile, the mysterious Thea (Roxburgh), is assigned to investigate the unit’s failed mission. While she cannot be certain, this CIA operative has a working theory of the case. Still, only Madani and Gallo know the truth about Somalia. Because she’s still recovering from gunshot injuries sustained during the mission, Nora is grounded from flying, by the Shadow Raiders’ commander, Col. Robert Haskins (Thatch). After learning Jimmy is still alive and in the clutches of a brutal terrorist cell, she resolves to return to the cockpit and accompany Leland on his mission to rescue Jimmy. As they train and prepare for their newest mission, Nora and Leland find themselves growing closer. Their desires end up at odds with their commitment to honor and duty. Will the secrets they are hiding help Jimmy, or are they putting everyone in grave danger? Stay tuned. Nora (Christina Ochoa) is ready to confess despite the consequences. Meanwhile, Ian (Charlie Barnett) is blindsided by an evil truth. Josh Reims wrote the episode, directed by Gregory Prange (courtesy of The CW). What do you think? Do you like the Valor TV series? Should this TV show have been cancelled or renewed for season two on The CW? 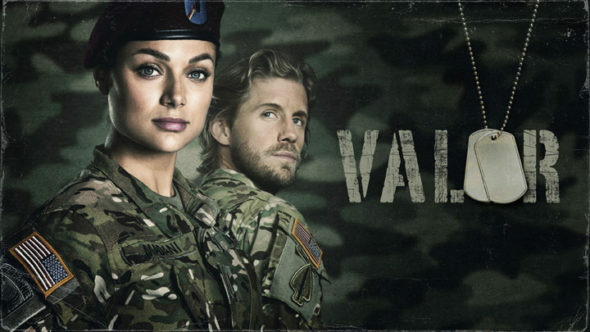 Valor: Is the CW TV Series Cancelled or Renewed for Season Two? Valor: Would You Watch Season Two of the CW Series? Definitely Renewed. I eagerly await each episode. My favorite series.